Jobsoid offers a very easy and convenient way of assigning candidates to your team members. This can be achieved by simply adding your team as Hiring Managers on the job opening which they need to hire for. These Job openings will be visible to them under "My Jobs" tab on the Jobs page. Candidates applying for such job openings will automatically get assigned to these hiring managers and will appear under "My Candidates" tab on the Candidates page. Click on the Job opening on the Jobs list page which will take you to the Job Details page. Edit the Job opening by clicking on Edit button on the action bar. Click on the Muti Select dropdown under Hiring Managers section. These users assigned as Hiring Managers will automatically start seeing the candidates which apply to your job opening. There is no separate need to manually assign candidates to your team members, thus simplifying your recruitment process. Jobsoid also allows you to assign Hiring Managers to a particular stage of the recruitment pipeline. This can be used to further simplify your complex hiring workflow by simply configuring it in one place. Under the Hiring Managers section, toggle the Advanced switch to ON. This will open a list of dropdowns for every stage of your configured recruitment pipeline. Under each of the dropdowns, select the names of to assign them as Hiring Managers for that particular recruitment stage. Candidates will be assigned to each of these Hiring Managers once they progress ahead in the different stages of your recruitment pipeline. For eg. 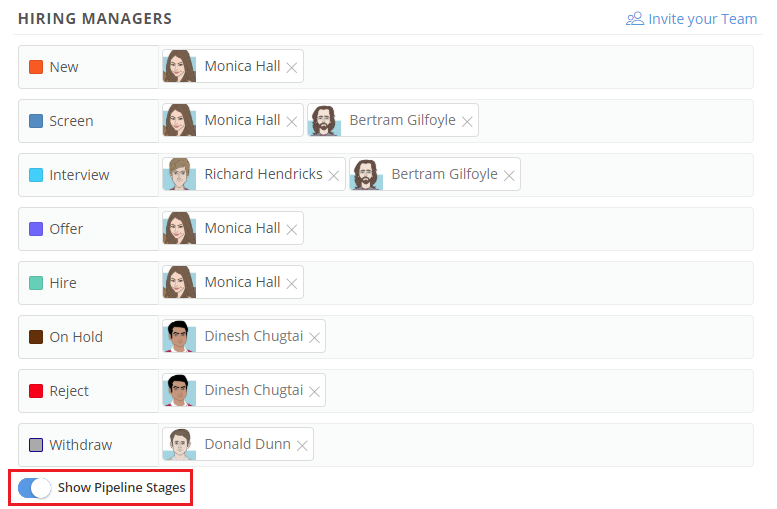 if user "John Doe" is assigned as hiring manager for the "Interview" stage, he will automatically start seeing candidates moved into the Interview stage, under the "My Candidates" tab.